Credit Bubble Stocks: No Longer Bullish On Bonds, But Was July 2012 the Top? No Longer Bullish On Bonds, But Was July 2012 the Top? Prechter's latest Elliott Wave Theorist issue (February 2015) repeats his call that the July 2012 low in the 10-year bond yield (1.46%) is a major, multi-decade low. Although recently we have thought of bonds as the flight to safety asset (moving inversely with stocks), he correctly points out that bonds and stocks have been going in the same direction since the mid-1960s. Both have been in a huge bull market. I had thought that bond yields cannot rise until after the stock market has crashed, because the government could just refuse to bail out the stock market and thereby "chase" people back into bonds. But I had not considered that people need to view bonds as perfectly safe in order for that to work. And treasuries clearly are not perfectly safe. That makes them vulnerable to going down with stocks when social mood becomes more pessimistic. The only thing that would rise would be the dollar - which of course has had a massive breakout. 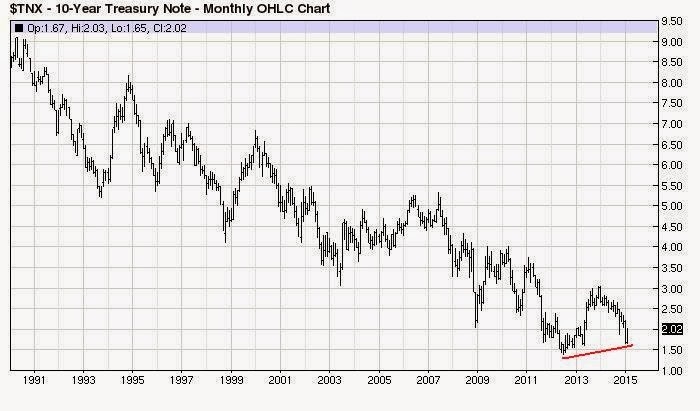 And you see that there have been a series of higher lows in the ten year yield after the July 2012 low of 1.46%. First, April 2013 was 1.66% and then January 2015 was 1.68%. I am officially open to the possibility that bonds have topped. I don't know CP, at 2.05% there aren't many countries yielding more than the US right now. Markets are pricing in a fairly rapid increase in short rates, with maybe even odds of 1% by early next year. In light of that 2.05% on the 10-year seems pretty pessimistic, and even more pessimism in the 30-year. If the US were completely isolated 1% in early 2016 might be possible, but there's no way we get to 1% without unwinding the USD carry trade. Even domestically, 1% would be catastrophic for housing and automobiles. I agree with your statements w.r.t. the welfare state and the health of the US economy, but IMO those concerns are somewhat separate from how treasuries compare to other investments over the next decade or two. Dysfunction in the US economy affects everyone who participates in the economy - productive people will get less of what they want for the same amount of effort. But, that concern is somewhat orthogonal to whether the future value of treasuries will be greater than other asset classes. The income from treasuries is relatively unencumbered vs. ownership in businesses that provide goods and services to Section 8 tenants at whatever price the government declares. IMO, under the present circumstances future USDs have additional value because it's really hard to anticipate what the economy will look like in the next 10 or 20 years. For example, I'd rather have 300 USD in 2020 to purchase a new cell phone than 300 USD in Apple or Samsung shares. Same goes for housing (there's no reason for it to be this expensive), energy (e.g. residential solar), and medicine. Basically, it seems likely that the deflationary forces of technology, which have only been made faster with cheap capital, will make future USD more scarce and more powerful than they are today. From a TA standpoint, there's no trend line break in that chart. Bottom *could* be in, but how does this low look any different from the lows in 1995, 2001, 2008 or 2010? Double bottom isn't confirmed until we get a trendline break and a successful test of it from the other side. No need to pick a bottom -- the interest rate cycle is multi-decadal,so waiting for the TL break and re-test of it is a safe move.